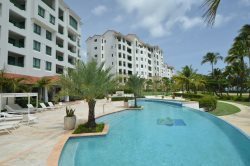 Welcome to our beach condo located at Las Palmas Doradas, Palmas del Mar Resort. Our condo is located just steps from the beach, Beach Bohio Restaurant, hotel and casino. It is a studio apartment with king beds plus a sofa bed in the living room area, kitchenette, balcony with view to the pool, lake and partial ocean view. Our guests also enjoy discounted rates at the Golf & Tennis Club, and access to the pools at the Beach Club (M-F @regular rates). Emotional Support Dogs are Welcome! Monthly rental includes electricity, Cable TV, WiFi, and water.